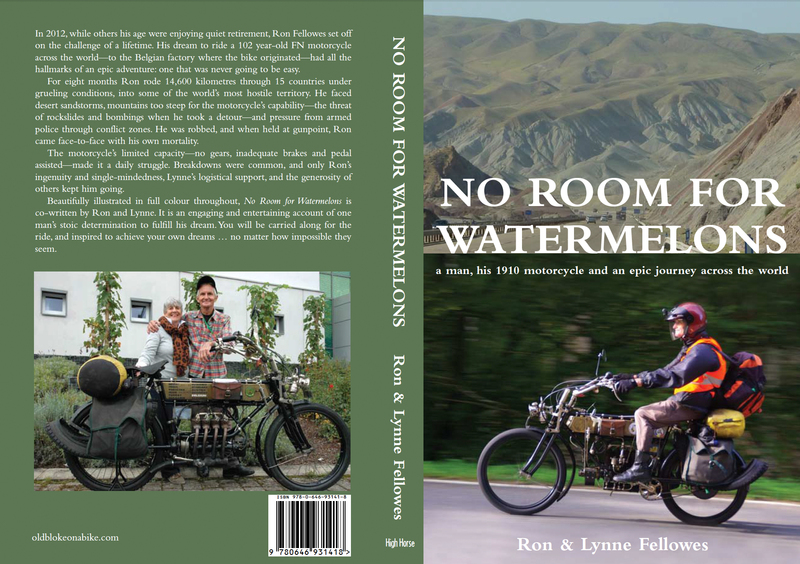 No Room for Watermelons has now been published. Yippee! Expected date of delivery is mid February 2015. We’ll be announcing the date of the book launch soon, but in the meantime, signed copies can be ordered here online. This is the book you’ve all been waiting for – much of it has never before been told. In 2012, while others his age were enjoying quiet retirement, Ron Fellowes set off on the challenge of a lifetime. His dream to ride a 102 year-old FN motorcycle across the world — to the Belgian factory where the bike originated — had all the hallmarks of an epic adventure: one that was never going to be easy. For nine months Ron rode 14,600 kilometres through 15 countries under grueling conditions, into some of the world’s most hostile territory. He faced desert sandstorms, mountains too steep for the motorcycle’s capability, the threat of rockslides and bombings when he took a detour, and pressure from armed police through conflict zones. He was robbed, and later when held at gunpoint, Ron came face-to-face with his own mortality. The motorcycle’s limited capacity — no gears, inadequate brakes and pedal assisted — made it a daily struggle. Breakdowns were common, and only Ron’s ingenuity and single-mindedness, Lynne’s logistical support, and the generosity of others kept him going. 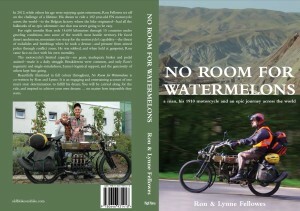 Beautifully illustrated in full colour throughout, No Room for Watermelons is co-written by Ron and Lynne. It is an engaging, and entertaining account of one man’s stoic determination to fulfill his dream. You will be carried along for the ride, and inspired to achieve your own dreams … no matter how impossible they seem.